Fire up the grill, it's the 4th of July! 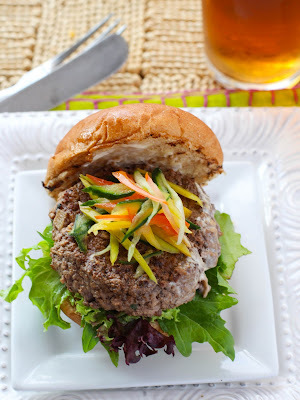 To celebrate Freedom Day, I am sharing with you my take on the quintessential burger. Almost everyone will be having a burger this holiday, so I've added some twists to make this recipe stand out. I want to break out from the shackles imposed by mainstream, snotty food experts who think mixing cultural influences into a traditional dish is taboo. Risotto with fish sauce, yikes, they say. Ube flavored macaroons, Why? they ask. My point is, why not play around with the flavors you are familiar with-- and when you get the balance right - it just works. A case in point is the Korean-Mexican fare that the Kogi truck in LA has popularized. Here in St Louis we have Seoul Taco, who have taken a page out of the Kogi truck experience - and they get the flavors right. The long lines forming at their food trucks prove that people like what they are creating. So again, it's freedom and we are free to play around... And so this is how I play! In a bowl, put the ground beef. Season with salt and pepper. Mix all the remaining ingredients together. Crack the egg. Mix altogether, gently. Do not over mix the beef. To make sure that the beef mixture is well seasoned, pan fry a teaspoon full of the beef mixtures and taste. Adjust the seasonings if needed. Now we’re ready to form our patties. Grab a chunk of beef and gently form a patty. This recipe yielded 6 patties. Pre-heat a cast iron pan on high heat. Add patties and cook it for about 2- 3 minutes per side. Sprinkle some toasted sesame seeds on top. Let it rest. Grill the buns on the same cast iron pan. Then play around with your flavors. For the dressing, I mixed mayo with chopped garlic, a teaspoon of vinegar and soy sauce, sugar and pepper. For the mango ensalada mix together, sliced mangoes, sliced cucumber and sliced tomatoes. (You may also add chopped cilantro) Set aside. Mix together 2 tbsp fish sauce, 1/3 cup vinegar, sliced onions, 1/2 tsp of chili garlic sauce, salt and pepper and sugar to taste. Come out and play... Enjoy! I love your creative use of Filipino flavors. Adobo Burger sounds sooo good. I love the the mango ensalada too. Wow this piece is fierce. Way to go! Fierce? I love that. Great to see you Trisha. Thanks Betty Ann for including this inthe article you are working for AbSCBN. I'm sooo thrilled. I always play with my food! 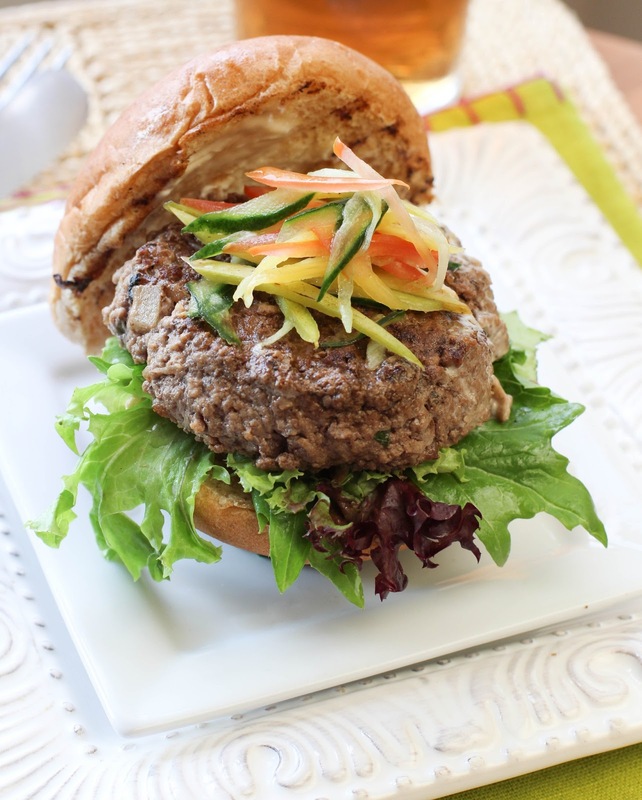 And an adobo burger with mango sounds exquisite. Really good stuff - thanks for this. And I hope you had a happy 4th! I hope you had a great one too. 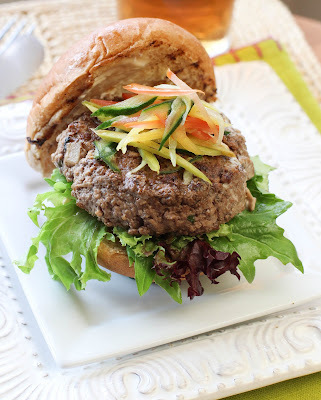 I'm ready to fire up the grill and get this adobo burger a chance. I'm with you when your palette says yum then it works. No rules in cooking. Thanks for the nod. Glad to know we are on the same page. Happy weekend.